Soil and air temperatures not quite warm enough for your crops? Add a hoop house! The year has just passed into autumn, which means fall garden color is bound to be on your mind. As I watch the rain hammer down for the first time in months, I can’t miss the yellow, red and orange overtaking erstwhile green foliage. These dominate the autumn palette. But, even pastels have a place in the fall garden. And, they don’t need to make your garden look like you’re ready to host an Easter egg hunt instead of a harvest party. These tones blend beautifully with the burnt and fiery hues taking main-stage as trees and shrubs get ready for their long, bare-branched winter’s nap. 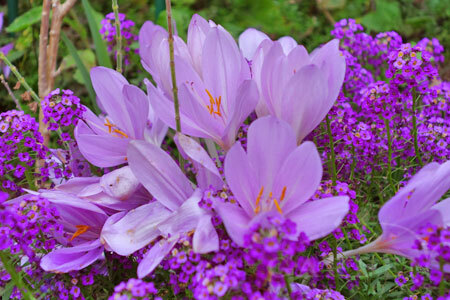 Fall crocus, or Colchicum, looks much like a green Hosta in spring. But, as days heat up, this bulb’s foliage collapses to the earth, so it’s ideal to plant them among summer annuals like this Proven Winners Lobularia ‘Dark Knight’* & other summer perennials. 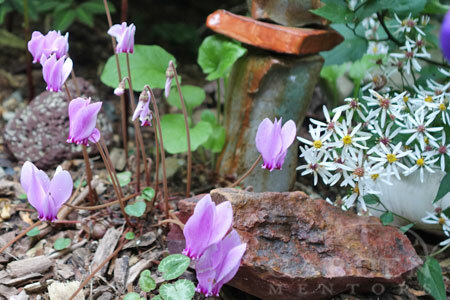 Later, just before the first day of fall, their pink flowers pop up among other, season-weary plants in the garden bed. This crocus will take some sun, but does best where it is somewhat protected. 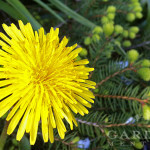 It’s tiny, so be sure to plant it near a path or border edge for viewing. 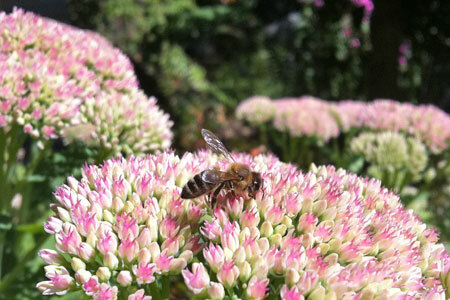 Sedum ‘Autumn Joy’ lives up to its name offering pink flowers from late summer into early autumn. Its young foliage is edible (if not very tasty) for humans & its flowers offer foliage for hungry bees. Later, as the seed heads fade to brown, those seeds will attract hungry Chickadees to your garden. Combine it with evergreen, orange-colored Carex testacea for year ’round interest. And, yes, this succulent loves sun & is very drought tolerant! Diminutive Cyclamen hederifolium carpets bare ground with ivy-like leaves all winter. Then, in mid-spring, the entire plant disappears into the earth until their pretty pink flowers rise up from the soil just as Autumn begins to fall. This one likes some protection from hot sun. And, it’s a tiny flower, so be sure to plant it near the front edge of a border where it can pop & enhance the beauty of nearby artwork or other fall bloomers like this Aster divaricatus. Of course, these aren’t the only pinks that appear in fall. Many trees turn shades of pink before shedding their leaves. Naked Ladies suddenly appear from otherwise bare earth, perfume the air with stunning pink posies. Tiny Schizostylis brigthens borders well into late autumn with pops of pink as well. And, of course, many hardy fuchsia flower in pink, feeding hummingbirds, until the frost takes them to earth for the coldest months of the year. Have a favorite pink flower or foliage plant for fall? Do tell! * Disclosure: Lobularia ‘Dark Knight’ shown here was provided to Garden Mentors by Proven Winners for free for test growing purposes. Garden Mentors has received no compensation from Proven Winners for this photograph or blog post. Great reminder on the Colchicum…I have the others mentioned, but this one needs to be on my list. As always, love your posts! Thanks Cat…glad this is helpful for you!